Has the Fall Festive Fever!! This weekend marks the annual celebration of days of yore with the Springs FolK Festival located in Springs, Pennsylvania. 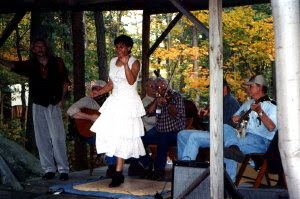 A mere 22 minute drive from Deep Creek Lake, the Springs Folk Festival is a celebration of arts, crafts, food, and labor that was once the lifestyle of our forefathers. Here you get to witness women weaving baskets and baking bread, the men threshing and sawing logs, while the children enjoy the simplicities of life with homemade toys, petting zoo, and a hayride. There is something magical about walking the grounds as you take in the pleasant aroma of maple sugar candy, listen to the chimes of bluegrass and gospel music, and witness the demonstrations that not only awe and inspire but clearly make you thankful for the advancement of today’s technology. Definitely come hungry and ready to enjoy a bevy of culinary treats. For those with a sweet tooth, you must try the homemade ice cream, funnel cakes, and lollipops. 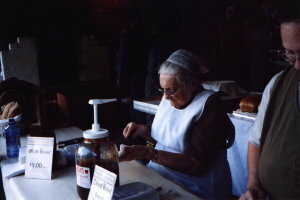 Meals are also served that consist of Pennsylvania Dutch sausage meals, pancakes, bean soup, and fresh baked bread. If that’s not enough, come and enjoy the variety of shopping available. Homemade quilts, baskets, carved wooden furniture, and jewelry is just some of the goods that the over 140 artisans will be showcasing. There is also plenty of entertainment throughout the festival with a variety of musical performances. Throw in a pageant of local talent, a maple sugar camp, and fall foliage that will surely amaze and this seems like a no brainer to me! Head to Deep Creek for the weekend and make a day of checking out the Springs Folk Festival for some good old fashioned fun! Until next week when festival fever hits again with the Autumn Glory Festival, see you at the lake! Previous Previous post: Falling for Fall @ Deep Creek Lake!